The paperboy looked more than once as he pretended not to notice the broken teeth of an uneven staircase. Even trick-or-treaters wouldn’t walk the steps that screamed worries and uncertainties to those with or without costumes. Many, many thanks. Good to be here. Thank you, Thank you & Thank you. I truly appreciate it. I really appreciate that Nelly. That is very inspiring. Thank You Nimi. I appreciate that. I wondered where you’d gone! Great photo and sentences. Dare I mention the split infinitive? I really appreciate that. Thank You so very much. Glad to see something from you as it’s been a while. Broken teeth. I never would have thought of it that way, but it makes perfect sense! Thank You Dee. I honestly appreciate it. Awesome photo and great two sentences. Definitely brought a smile! I appreciate that Anjali. Thank You so much. Another gorgeous 2 sentences. I missed you. So glad you are back! You are so kind Mary. Thank You. Thank You Anna. Much appreciated. Yay! I knew you were around because you have not ceased to support my blog and encourage me with “likes” but every time I came here, no new sentences. Wow Shona! !…Thank You, Thank You & Thank You. Your kindness drips from your wonderful words and I greatly appreciate it. Wonderful post. A beautiful photo to accompany the poignant twosentences. Thank you for your “likes” on my blog to remind me to come back to your great postings. They make me think and reflect on things. I honestly appreciate that Carlo. Thank You so much. Adding my voice to the chorus. I know you have been visiting my blog, which I so appreciate, and I email subscribe to yours, so I knew I would get notification when you posted again, but I did sneak over occasionally to check in case a glitch had occurred and you were posting again but I wasn’t getting my daily digest for some reason. Looking forward to more new posts in the coming weeks! You are so very kind Joanne. Thank You, I greatly appreciate it. Missed you – good to see you back! I’ve missed you as well! You’ve returned in stellar style with this. I also want to thank you for visiting my blog so frequently. I really appreciate your wonderfully kind words Kim. Thank You so very much. I appreciate your kind words JoAnna. Thank You. I must add my welcome back and with a winner for this fall season. Hope all is well in your place! Thank You so very much Jean. Thank You Nx. I really appreciate it. Glad to see this again! As everyone above, I agree; I missed reading this! Thank You so very much for your kind words. I honestly appreciate it. good thing that i have stumbled upon this great site.. will surely come back (as i’ve bookmarked this already) for more..
Love the image this paints of what the trick or treater is seeing! I greatly appreciate that. Thank You very much. Perfect– I don’t know how you come up with such rich sentences from a photo– but I do love those broken brick steps. That is very kind of you Rhonda. Thank You so very much. You made me laugh out loud! Thank you. I needed that this morning. Somehow I missed your last two postings. Good to see you back. This picture is marvelous! 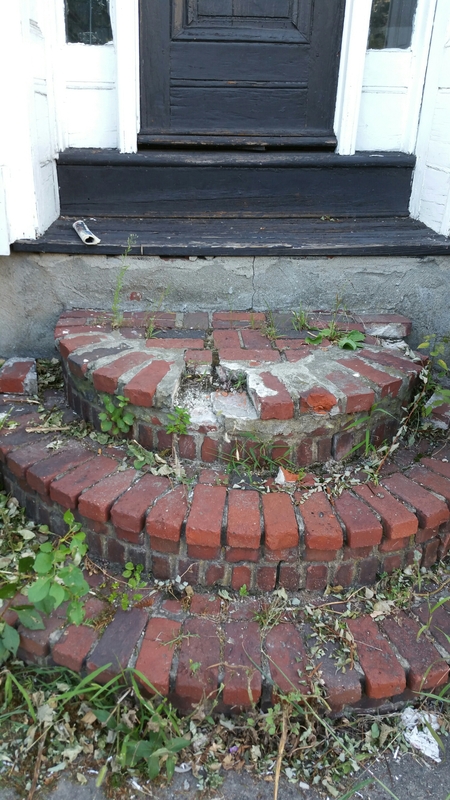 Whoever owns these steps should be banned from ever repairing them. I greatly appreciate that Dennis. Thank You so very much for your kind words. Hahaha, I like it. How are you?